Beechworth isn’t a place many people visit. Around four hours from Melbourne (taking the fast route), seven from Sydney, or a comparatively easy five from Canberra, this remote inland region sits across from the Victorian Alps – a slew of dramatic and densely forested slopes that reach altitudes of almost 2,000 metres and form part of the Great Dividing Range. The town itself is like something out of a country and western film – built during the Gold Rush of the 1850s, it’s all too easy to imagine saloon doors swinging and cowboys swaggering into the sunset. But it’s on the slopes around this little town that some of Australia’s finest wines are made. Nathan’s dad, Rick, arrived in the region in 1980, originally taking up a post as Assistant Winemaker at Brown Brothers before striking out on his own. “He was coming past and saw a for-sale sign. None of this existed up here, it was just a big granite outcrop really. It wasn’t even really a productive farm or anything like that,” Nathan says. For some reason, it prompted him to set down roots – both literally and figuratively, with the first vines in the ground in 1982. Today Giaconda – one of Australia’s most iconic names – is formed of 11 acres up on these blustery sun-baked hills. Standing in front of the granite and brick winery, a combination of dense bush and straw-yellow fields seasoned sparsely with trees stretches for miles. But the estate itself has select plots of lush-looking vines carefully positioned and tended: Chardonnay lines the south-facing slope, leading down to a bed of Pinot in the cool, deep soils of the valley, while Shiraz is nestled in a natural amphitheatre. While rich and struck-match Chardonnay has made Giaconda’s name, it seems that the future might hold something different. 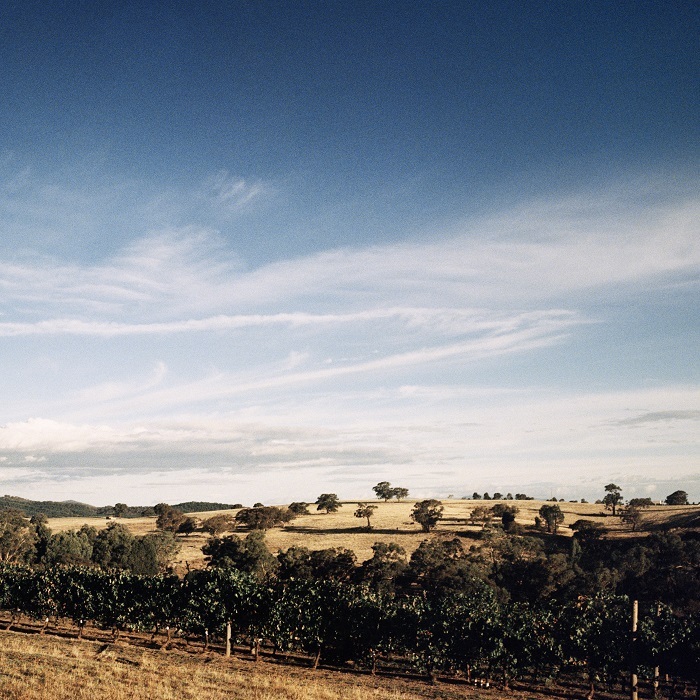 In 2010, it planted just over an acre of Nebbiolo on Red Hill, the highest point in Beechworth. “It’s a different terroir,” Nathan explains, “Most of Beechworth is old decomposed granite and up there on Red Hill it’s a rich red clay. It’s cooler, more elevated – it’s where we need Nebbiolo to be. We think in 20 years it’ll be a magnificent site for the wines; we’ve just got to prove it with a bit of vine age. It’s kind of what we’re hanging our hats on.” While Nathan and Rick aren’t yet ready to put the wines out under the Giaconda label, the quality of the fruit and the site is clear – bracing structure entwined with spicy, floral perfume. Wandering past the Shiraz, Nathan guided us down to Giaconda’s cellar: an incredible space dug out of the solid granite rock. Lit faintly by chandeliers, with a table and chairs in amongst the library wines, it feels like slipping into a WWII shelter rather than a working cellar. At the far end, a rickety ladder leads up through a pothole-like gap, winding 25 metres through the rock and up to the winery at ground level. “I have to go up and down once a year,” Nathan confesses. Just one line runs between the winery and cellar – the cleaning of which is cause for Nathan’s annual chimneysweep-style scuttle; with gravity’s help, it’s used to transfer all the juice into barrel. In April, the 2018 wines were all in the cellar, and Nathan’s excitement for the vintage was irrepressible. 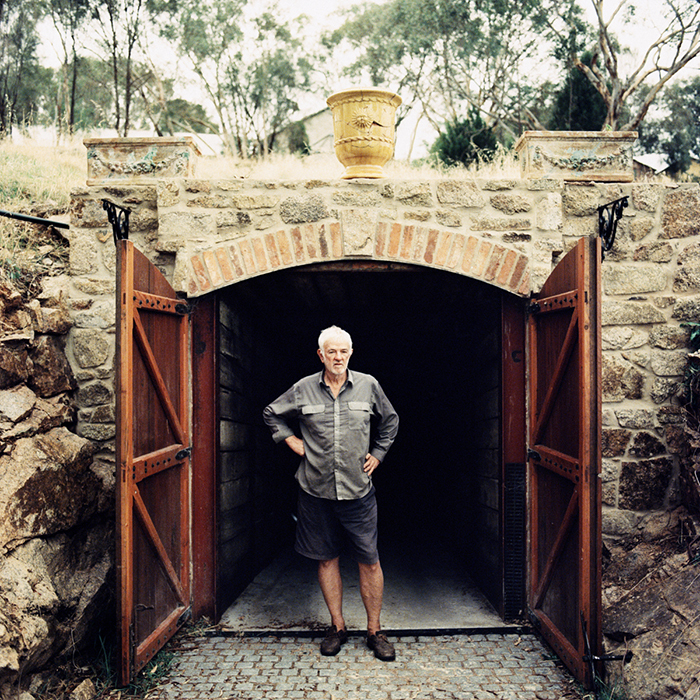 “I’ve done 11 vintages here for dad – and it’s my favourite one. The wine doesn’t feel too big. It doesn’t feel too flabby. It feels really bright and lively. And once the structure comes in behind it… Yeah. It should turn into something pretty magic,” he smiles. It’s that perfectionism that raises Giaconda’s wines to the next level; after 35 years, the winemaking process is still constantly being tweaked, Rick and Nathan always looking for an opportunity to make the wines even better. But in true Aussie fashion, they couldn’t be much more down to earth – just a couple of guys who happen to make some of the world’s very best wines. While we don’t currently have any Giaconda in stock, keep an eye out on bbr.com.